You are here: Home » Sweet Talk » NO, GOD DOES NOT HAVE A PLAN FOR YOU! Not if you mean an exhaustive set of detailed schematics that he decided before you were born and that you must discover or be doomed. Back in the 1970’s I began a thirty-year career as a commercial real estate appraiser. I’ll never forget the first time I unrolled construction plans for a proposed pre-school building I had been hired to evaluate. The first large page was the “Site Plan”, showing the overhead street, land, building, and playground layout. It still smelled of fragrant blueprint ink. The next sheet was the “Elevation Plan” showing a street view what the finished property would look like. Then came the grading and compaction plan that would result in a level lot with adequate drainage. After that was the foundation plan, with details of the concrete slab and footings. Then individual specification sheets for electrical, plumbing, framing, roof, gutters and downspouts, doors and windows, flooring, stucco siding, landscaping, walls, gates, fences, and more. Whew! Every little detail was laid out on paper by architects, engineers and other professionals so that no mistake could be made. 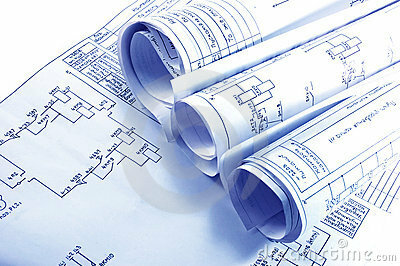 Plans make it easy for the contractor; he doesn’t have to think, decide, calculate estimate, wonder, guess, or take any risk. He simply must stay within what the experts had already laid out. In life, when we feel confident, have enough money, and the future looks rosy, we don’t need or want anyone telling us what to do. We value our FREEDOM. But when we get overwhelmed with responsibilities, are in pain from failed efforts and relationships, or just want to avoid hard work, we want God to figure it all out for us. Why can’t he just tell me what to do? We want blueprints! We want SECURITY. With freedom comes the possibility of making painful mistakes. With security comes the promise of protecting us from that pain. We’ll always live within that tension between freedom and security. In tough times, it’s appealing to believe God has detailed drawings of the best place we should live, when we should move, whether we should marry or not, and whom we should marry, what job we should take, how many children we should have, and all the other difficult decisions that weigh us down. All we would have to do—like the contractor—is follow the plans. Children who played in an area with no visible fence stayed close to the playground equipment and teacher, wary of an avoiding the larger playground for what dangers may have lurked out there. Children who had and could see the fence knew that it kept them safe from strangers, dogs, or cars and, feeling secure, they had more freedom to explore and enjoy the larger play area. Right up to the fence’s edge! Rules, regulations, and fences provide security which increases freedom—and peace. God’s laws and his Church’s precepts all set healthy boundaries for living. Within those, there is still lots of room for freedom, individuality, and diversity to play. Of course we need to rely on God, but fear and a lack of trust or understanding, however, can keep us clinging to the teacher’s skirts—or asking God to show us every little step of the way we should go. Yes, he’s limited where we play, but (outside of special circumstances) he won’t then micro-manage us to which swings to use or monkey bars to climb. He wants us to choose. Do you want to know what God’s plan is for you? It’s to stay within the fence he has erected but to have freedom and fun inside of it! ( 1 ) He has already shown us his big plan. A: God made me to know him, love him, and serve him in this world so I could be happy with him in the next. Boom! There’s God’s 3-point plan for everyone. And it allows for individual freedom of expression and diversity in gifts. The Church helps us know him. The Holy Spirit helps us love him. When those happen, then our natural desire will be to serve him in a myriad of ways. ( 2 ) He wants us to make decisions. There is no single “soul mate.” There may be many people who would make a good spouse for you—within prudent boundaries he wants you to be free to choose who most delights you! Soul mates are forged in long-time authentic commitment and love. With freedom, there will be occasional doubt. Sometimes you’ll fall or get lost. Yes, sometimes an “angel” will appear with a detailed map to help you out of your predicament but most of the time God will simply point you back to True North and allow you time and freedom to find your way back. ( 3 ) His knowing is not the same as his deciding. Even though God knows everything you’ll do in life it doesn’t mean he plans it all. That would make him a puppet master and deprive us of freedom to choose authentic love and holiness. I knew my kindergartener would eventually fall on the playground and get hurt, but I sent him to school anyway. I knew my teens would get likely drunk and skip classes, but I sent them to college anyway. I didn’t want those things for my children—and tried to train and caution them—but out of love and remembering the greater picture I allowed their freedom. ( 4 ) He never plans to abandon us. His giving us freedom, pushing us out on our own, and letting go is not abandoning us—even if we feel like it. We are never alone or without the help and strength we need from him. His grace is sufficient for us. We simply need to go back to what we know—he will never leave us or forsake us (Hebrews 13:15)—and not on what we feel for the moment. ( 5 ) His plan is to bring greater good from our failures. God’s “perfect” will does not desire evil; his “permissive” will (plan), however, grants us the freedom to choose and the promise to bring greater good from the evil if we turn back to him. If you sin, repent and confess. Get back on track. Choose to go higher . . . and watch God bring something good from your failures regardless of the natural consequences you or others may have to endure. ( 6 ) His plans are broad and preserve our freedom. God gave Moses only ten commandments and then Jesus summed them into two: love God with your whole heart, soul, and mind, and your neighbor as yourself. (Mark 12:30-31) But the Israelites—who wanted the easy, all-spelled-out-so-we-don’t-have-to-think set of blueprints—turned them into 613 rules. Broad plans leave room for appropriate freedom. ( 7 ) His plan never contradicts common sense and good judgment. We are rational beings; God has given us gifts of free will, intellect, intuition, and instinct. Emotions are a gift, too, but they can be damaged and given too much weight when we’re making decisions. Other gifts include mental and physical abilities, temperament, imagination, and all that makes us “made in his image.” His plan is that we exercise that freedom and use those gifts to invest in and create a good life . . . within the bounds he has set for our safety and happiness. The parable of the “talents” is not just about money but how we use the brains God gave us. St. Ignatius of Loyola says in his Spiritual Exercises: don’t act on impulse either when too elated or too depressed; make major decisions at times of peace and emotional balance. Even Weight Watchers has sound advice: “HALT!” Never make big decisions when you are too Hungry, Angry, Lonely, or Tired. ( 8 ) His plan is that we develop virtue. Pay attention to normal obstacles. If it’s unlawful, excessive, you can’t afford it, it would be using someone, depriving someone of something necessary or good, or putting yourself or others at risk, it’s probably selfish, sinful, and not part of God’s “plan” for you. ( 9 ) He wants us to take up our cross. God wants us to freely choose to share with him in everything—including the cross. In Colossians 1:24, Paul reminds us that we complete what is lacking in Christ’s suffering and death. Thus, part of God’s plan is that once we know and love him we also enter into and discover the joys and sufferings of his saving work—and not just going to church, giving alms, and think about retiring with a big, fat pension. (Although there is nothing subjectively wrong with a big, fat pension!) Sacrifice for a greater good is the essence of holiness, which leads to true happiness, and the opportunity for it is in every time, place, and situation. A word about “suffering”, though: we obviously experience suffering when we have sinned or used poor judgement; that type of suffering is usually an unplanned natural consequence. Sacrificial suffering—the kind that brings redemption—is freely letting go of our own self-centered needs and wants for the greater good of another. It unites our pain with his. Wisdom is needed here so that we are not “sacrificing” simply to gain others’ approval or acceptance. Or doing what they want because it’s easier and avoids conflict. (10) He takes pleasure in our preferences. God wants us to make plans that appeal to our hearts—if we are meeting the basics first. Remember your school art projects? In kindergarten, maybe you all got the same snowman to color because you had to first master staying in the lines and carefully using scissors. But later, the teacher gave you lots of blank paper, paint, glue, or glitter and let you decide what to make. She let you plan, create, and work to make something beautiful—or clever, zany, quirky, cute, majestic, or mysterious—of your materials. God also takes great delight when we use what we have and what life has to offer—even in adversity—to make something beautiful for him. It isn’t always easy. We will fail. But with each failure can come wisdom, strength, and a renewed love for and trust in God. That’s when our plans share in his divine plan.